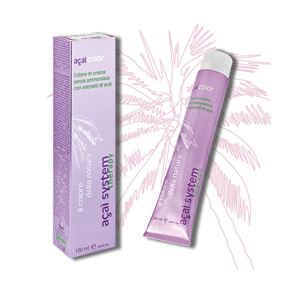 AҪAÌ COLOR permanent cream is a completely new and very gentle with no ammonia. It offers all the advantages of a classical dye but without the risks of allergenicity. Ideal for those who suffer from sensitive skin or sensitization. AҪAÌ COLOR ensures bright hair, bright colors and a long-lasting gray coverage to 100%. Its composition with extracts of acai has decongestant, soothing and skin restoring. Shades 55 shades in the range ASH, BEIGE, NATURAL, GOLD, COPPER, MAHOGANY, RED, PURPLE, MOCHA, CHOCOLATES, ADDITIVES.